Consumer Reports has decided to weigh in on the health care debate in favor of the Democratic health care proposals, or what CR euphemistically calls “health care reform.” Having decided to take sides, I think it is fair to hold CR to the standards it expects of the manufacturers and service providers reviewed monthly in its flagship magazine, and on its website. Consumers Union (CU) is an expert, independent, nonprofit organization whose mission is to work for a fair, just, and safe marketplace for all consumers and to empower consumers to protect themselves. The organization was founded in 1936 when advertising first flooded the mass media. Consumers lacked a reliable source of information they could depend on to help them distinguish hype from fact and good products from bad ones. Since then CU has filled that vacuum with a broad range of consumer information…. Is the CR position, as laid out on its health care reform website, consistent with its mission statement? Does it provide information which empowers consumers to make a fully informed decision? And does CR present the negative as well as positive aspects of the pending health care proposals, so that consumers can distinguish hype from fact? Unfortunately, the answer to each of these questions is that CR has not lived up to its own standards. The presentation on the CR health reform website is completely one-sided and presents only the best case scenario as to health care reform proposals on the table. As discussed below, CR’s presentation is partisan, and potentially misleading, in numerous material respects. CR’s presentation is what one would expect from an advocacy group with a political axe to grind, not the heretofore non-partisan name in consumer protection. 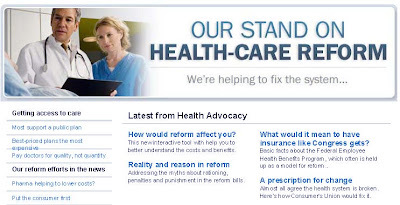 (Note: CR’s general website has numerous health care related pages; I have limited my review to the health care reform website and related links being promoted by CR as part of its public relations effort — partial screen shot below — since this is the site most consumers would consult as to CR’s health reform position). But the survey at the heart of CR’s position was taken several months before there were any concrete Democratic proposals on the table. House Bill HR3200 was not issued until July, and we still are trying to find out what the full Senate will propose. CR does not note that in the intervening months since its April survey, other polls have shown widespread dissatisfaction with the Democratic proposals. Rasmussen most recently listed support for Democratic proposals at just 41%. Congress is discussing several ideas to address healthcare reform. One proposal provides everyone, whether insured or uninsured, an additional choice: the option of a public health plan that people can count on to cover what they need at more affordable rates. This option would allow people with good insurance that they like to keep it. Those without good insurance can gain access to reliable healthcare, regardless of preexisting medical conditions, and obtain a consistent menu of benefits. This public plan would be paid for by enrollees. Those that cannot afford to pay the full premiums would be subsidized based on their income. Given this preface, which seeks to portray a public option in the most positive light possible, without a hint of problem, it is not surprising that a majority of respondents responded favorably. Using such loaded pro-public option questions unfortunately is a common tactic by supporters of a public option. But as CR surely knows, there are real disputes as to whether the introduction of a public option would result in employers dropping coverage and paying the health care tax instead, and whether it is realistic to expect that a public plan can be covered by premiums. Had the question been asked in a more neutral manner, and included possible negative consequences such as loss of existing coverage, the response likely would have reflected current polling which shows a majority against Democratic proposals. Fear of losing existing provided coverage is a concern shared by 63% of the population, but warrants hardly any mention on the CR health reform website. So the heart of CR’s policy position on health care reform, the public’s supposed support for a public option, is at best questionable, and at worst misleading. And the entire presentation lacks any semblance of balance, thereby depriving CR readers of the opportunity to weigh competing views. Were this a position paper by a Democratic advocacy group, such lack of balance might be acceptable. But CR holds itself out as an advocate for providing consumers with information as to the good and bad aspects of products. Unfortunately, CR has exempted Democratic health care reform proposals from CR’s usual analytical standards. Additionally, there also are four main sections of the CR health reform homepage, highlighted in the center of the page with boxed links. I will address each of these. CR has a link to a series of profiles purporting to show how various consumers (by age, life stage, insurance coverage, etc.) would be affected by reform, under the title How would reform affect you? But as noted, this is a hotly contested issue, but one would not know it by reading CR’s chart and profile discussions. This is a critical issue considering that an overwhelming majority of Americans are satisfied with their existing insurance coverage, yet CR glosses over coverage issues by presuming that everyone happy with their current coverage could continue that coverage. On page 4 of the profiles, CR addresses a family (“the Taylors”) with “good coverage through employer.” Again, there is no attempt to address any negative consequences of Democratic proposals. CR presents only the upside. This is consistent for all the profiles. Does anyone actually believe that Democratic proposals are all good, with no downside? Apparently CR does, or at least that is how it presents its profiles. Of all the CR fluff, these profiles most disturbed me because they are directed not at public policy in general, but at specific types of consumers without disclosing negative aspects of the proposals on the table. Why Mention Federal Employee Coverage? What would it mean if we all got benefits “as good as Congress gets”? It might mean we all get access to something like the Federal Employee Health Benefits Program, which often is held up as a model for reform. Why is CR highlighting the FEHB on its health care reform homepage as one of four main links, with this language on the linked page? No one is talking about extending the FEHB to everyone. In fact, participants in the FEHB have been exempted from the proposed public option in the Democratic proposals. The issue of whether Congressmen would give up their FEHB coverage for the public option generated much heat at the summer townhalls. The Federal Employee Health Benefits (FEHB) program is often held up as a model for health reform. The idea has a nice ring to it: “Everyone should have health care as good as members of Congress.” This fact sheet summarizes some basic facts about this program. FEHB program is generally considered to do a good job providing coverage, but it’s certainly not perfect. CR’s trumpeting of the FEHB is highly misleading, and likely leads many readers to think they will be getting coverage similar to FEHB under the public option. Yes, CR does not say so explicitly, but it also does not say that FEHB has nothing to do with pending proposals. This tactic of highlighting FEHB, both through placement on the page and language used, is the sort of bait-and-switch tactic which normally gets CR’s ire. The first “myth” addressed is that the health care proposals will lead to “rationing.” But CR sets this up as a strawman argument, addressing an issue (hospital readmissions) which does not go to the heart of the rationing debate. The issue of rationing arises because the government does not have the money now to cover its current Medicare and Medicaid obligations, and there are not enough people to tax to generate revenue to expand these provisions and provide subsidies to support the new public option. Something has to give, and what will give is huge cuts in current benefits, and inevitably, the type of de facto rationing that takes place in Canada and Britain where people have to wait weeks or months for appointments and treatment because there are too many people seeking free care from too few doctors. CR does not address this issue. Instead, CR addresses the issue of hospital readmissions, which I analyzed in a prior post. The issue is whether new government policies will create incentives for hospitals not to readmit patients. Regardless of how you come out on this issue, this is a side issue in the rationing debate. For CR to seek to defeat the rationing problem by addressing a side issue and not the core of the problem may be a useful rhetorical device, but it is not a fair rhetorical device. CR then turns to the health care mandate, which will require people to purchase coverage under threat of tax penalty and ultimately, jail. This mandate has sparked interesting constitutional debate, but at a minimum, is a sea change in the way government treats taxation. First, health care insurance information will be reported to the IRS, which will play the role of mandate enforcer. Involving the IRS in our health care system is troubling to many people, but apparently not to CR. Additionally, as I have posted before, for the first time we would be authorizing the federal government to tax people for failing to engage in economic activity. This taxation is unlike mandated auto insurance (which CR uses as an example in an attempt to justify the mandate) because only those who drive must purchase auto insurance. The health care mandate covers everyone, even those who would prefer to and can afford to pay for health services themselves. The concept of health savings accounts (i.e., catastrophic insurance coverage) would be eliminated since such accounts would not be “acceptable” coverage. The notion of self-reliance would be destroyed, but to read CR’s explanation, anyone who wants to rely on themselves is shirking a societal responsibility. This may be an argument, but it is a completely one-sided argument the way presented by CR. And considering that CR is tax-exempt, it hardly is in a position to be lecturing the rest of us about our shared responsibility. CR addresses other issues, and I encourage you to read for yourselves. I think you will find that CR has taken on a pure advocacy position for the Democratic proposals, and does not attempt to present contrary information, such as insurance industry reforms which accomplish many goals without restructuring the entire health care industry. CR’s attempt to justify higher taxes on the wealthy to pay for all this ignores the reality that there are not enough rich people to pay for massive health care spending, and all the other spending proposed by the Obama administration. For decades, Congress has put off dealing with our nation’s health care crisis ever-spiraling costs, insurance industry traps that put profits over people, and too many uninsured that drive up all our costs. I expect you to finish the tough work on health reform this year, and commit to giving all Americans access to affordable, reliable health coverage. There are ways, by creating national health insurance markets and certain minimum standards, for example, to dramatically improve access to and treatment of consumers under health insurance. These reforms do not require restructuring the health care industry or massive government taxation, mandates, and penalties. By using some bad insurance industry practices as a justification for health care restructuring unrelated to insurance practices, CR mixes up concepts and seeks to use an issue on which most people agree (insurance industry reforms) to argue for an issue on which most people disagree (taxes, mandates, Medicare cuts, etc.). CR has stepped out of being a provider of unbiased information (both good and bad) to empower consumers to make their own informed decisions, and has become a political advocacy group which seeks to minimize the legitimate arguments against the current Democratic proposals. If that is what one was expecting from CR, that’s fine, but that is not how CR presents itself to the public. There is nothing wrong with CR taking a position on consumer issues, and I agree that the insurance industry deserves much criticism and reform. But CR has gone far beyond such consumer protection issues and has jumped headlong into disputes as to the role of government in our lives. When it comes to this fundamental issue of individual liberties versus government control, CR has no special expertise or legitimacy. It may be hard for CR to understand, but the health care debate is not just about coverage or costs. As President Obama himself has commented, the heart of the dispute is over the role of government in our lives, which is why people are so passionate. It now is clear where CR stands on this fundamental issue, and it is not on the side of those of us who value self-reliance as the first choice, with a safety net being only for those who, through no choice of their own, cannot provide for themselves. CR has taken the side of those for whom the safety net is an excuse to expand government control and social engineering. By using its non-partisan reputation to advocate a big-government political agenda, and doing so in an unbalanced and specious manner, Consumer Reports has lost the right to hold itself out as an unbiased consumer advocate in the health care reform debate. So "death panels" and "healthcare rationing" are reliable healthcare. Only a total ignorramous or idiot would think that the government can provide better anything than privately run organizations can. It is nothing short of amazing how many agencies/groups/individuals have decided to throw everything overboard and dive into the tank with Obama. Amazing… and more than a little scary. Consumer Reports has often taken what some of us consider ideological positions, they've never seen a statist regulation they don't like whether it's the 55mph NMSL or 1.6gpf toilets or just about any other Federal intervention in our lives. Thank you for bringing this to my attention. I just cancelled my online subscription to CR. I'll be damned if they'll spend my money pushing this crap. Consumer Reports.. a purveyor of electronic goods, kitchen spatulas and garden hoses is suddenly an EXPERT in Health Care Policy? That's as laughable as the public taking cues from Gamestop.com on National Defense Policy. File this under 'Cartoons'. Unfortunately not surprising. I cut off CR a couple of years ago for their leftist anti-physician slant. This is an example of the discussion my friends and I have about whether the left leaning direction of this nation, with all of the companies, media organizations, and government positions being headed by what seems to be leftist, is by accident or by design. Did Consumer Reports get a phone call from Obama? Or did they just follow their already established philosophy of liking government regulations? Is the seeding of key industries with left leaning executives an accident, or a result of years of leftist education? This is a good argument to have, because it helps establish where the failure occurred. Were we too complacent in the "everybody's views are equal" issue and let bad teachers and bad philosophies into our schools? Or are we victims of that rumored theory that Communists has been planting their people in our nation for forty years? Stupidity or an act a war on our way of life. An interesting argument and one we need to answer. Our future depends on it. I abandoned Consumer Reports almost 2 decades ago when they found a difference in vitamins which, unknown to them of course, were manufactured not only at the same factory but from the same batch. At that time they were just getting heavily into the "wellness" industry with various publishings no different than those others in the market at that time save for banking on their "Consumer Reports" brand. Thank you for bringing this to my attention as well. I have cancelled both my online and print subscriptions. Whether or not I agree with the positions they took, it is certainly outside their mission and why I used to be a subscriber to their services. Never again.